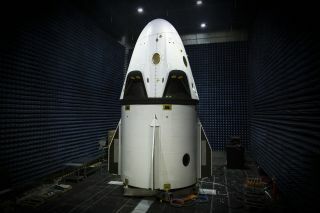 SpaceX's Dragon crew capsule is scheduled to undergo a test that will simulate an emergency launch abort on May 6, 2015. The manned version of SpaceX's Dragon capsule will take to the air Wednesday (May 6) in a critical test of its launch-emergency systems. A Dragon spacecraft test vehicle is scheduled to lift off at 7 a.m. EDT (1100 GMT) Wednesday from Florida's Cape Canaveral Air Force Station in a "pad abort test," which is designed to see how the capsule performs in the event of a problem during launch. "This is what SpaceX was basically founded for — human spaceflight," Hans Koenigsmann, vice president of mission assurance with SpaceX, said in a statement. "The pad abort is going to show that we've developed a revolutionary system for the safety of the astronauts, and this test is going to show how it works. It's our first big test on the Crew Dragon." The SuperDraco engines will burn for just six seconds. But together they will generate 120,000 pounds of thrust — enough to get Dragon out of harm's way during a real launch emergency, NASA officials said. The entire test should take just 90 seconds from liftoff to splashdown. Dragon is one of two private American spacecraft that NASA hopes will be ready to fly astronauts to and from the International Space Station by 2017. The other is the CST-100 capsule, which is being built by Boeing. Last September, NASA awarded SpaceX $2.6 billion and Boeing $4.2 billion to complete their development work on the two spacecraft and get them ready to fly. Dragon and the CST-100 are being groomed to fill the crew-carrying shoes of NASA's space shuttle fleet, which retired in July 2011 after 30 years of service. The agency is currently dependent on Russian Soyuz spacecraft to get American astronauts to and from orbit. On Wednesday, Dragon will sit atop a truss structure rather than SpaceX's Falcon 9 rocket. The test is unmanned, but Dragon will be carrying an instrument-studded dummy dubbed "Buster" that will measure a variety of forces. The capsule itself is also outfitted with 270 sensors, NASA officials said. "There’s a lot of instrumentation on this flight — a lot," Koenigsmann said. "Temperature sensors on the outside, acoustic sensors, microphones. This is basically a flying instrumentation deck. At the end of the day, that’s the point of tests — to get lots of data." The data gathered during the test should be valuable even if the flight doesn't go entirely according to plan, NASA officials said. "The point is to gather data; you don’t have to have a flawless test to be successful," Jon Cowart, NASA's partner manager for SpaceX, said in the same statement. "One test is worth a thousand good analyses." The test window opens Wednesday at 7 a.m. EDT (1100 GMT) and closes at 2:30 p.m. EDT (1830 GMT). SpaceX also plans to conduct an in-flight abort trial with Dragon and the Falcon 9 sometime after the pad abort test, company representatives have said. While SpaceX is now getting the manned version of Dragon ready for flight, the unmanned variant already has a number of space missions under its belt. SpaceX holds a $1.9 billion NASA contract to fly at least 12 robotic cargo missions to the space station using Dragon and the Falcon 9. The sixth of these flights, all of which have been successful, launched last month. You can watch the SpaceX Dragon pad abort test on Space.com, courtesy of NASA TV. The launch webcast will begin at 6:35 a.m. ET (1035 GMT).